Max and I went to the Arboretum on Wednesday. 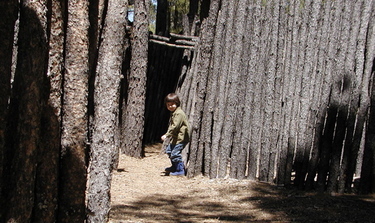 As usual, the highlight was the children's maze, made out of small-diameter pine poles. and water bugs! I finally get around to describing the lead picture! There was a little stream going under a footbridge so we got a close up view as they flitted around. 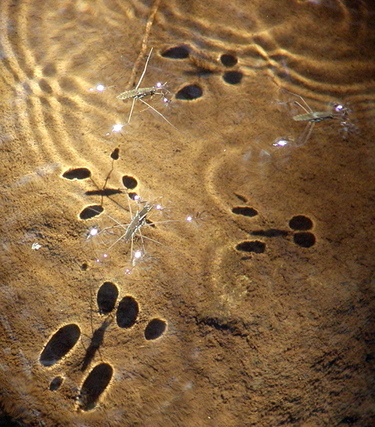 The sun was just right so they were casting cool shadows on the rock below, and beads of water on their feet and antennae were glinting in the sun. Today is my last day at work. I'm experiencing lots of conflicting emotions. I thought I'd be ecstatic when this day finally came, but as it got closer I've become more apprehensive and stressed out. Probably that's normal with any major change. I've started to worry about losing my identity, things like that. But I'm also excited to be able to be home with Max. 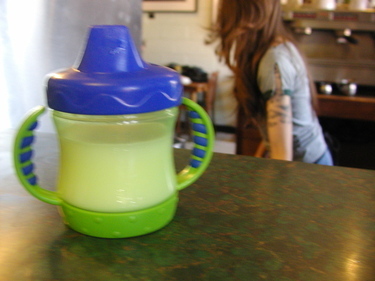 We'll see how this all shakes out over the first few weeks and months of my SAHM-hood. 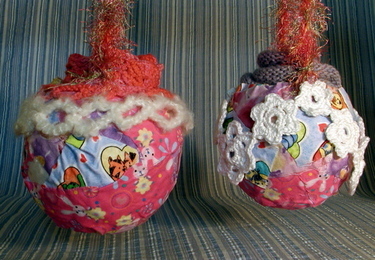 In a previous post, I showed some fabric baskets stuffed with something going off to some friends. Since they've received them, I'll show them here now. Inside the baskets were matching big sibling & new baby birdie monkey hats. The blue ones were for Carabeth's Amelia and Burke and were made from Southwest Trading Company's Karaoke (50% soy silk, 50% wool) in the Bluezzz colorway. The pink ones were for Abby's Roxanne and new baby, and were made from Wool in the Woods' Helix (97% cotton, 3% nylon) in a pinky colorway. Carabeth reports that Amelia's two little ponytails fit perfectly inside the "ears"! I wanted to tell Anamaria (who is wonderful and who I was lucky enough to meet in person when I was in DC) that the version of the pink hats that you saw was ripped out another two? times before I finally got a lace pattern I was happy with. I think this one is called something like cat-eye, I'll have to look it up. I'll leave you with a view of my drive in to work yesterday. It was a pretty hazy day, so it's not as crisp as it could be. This is the drive up to the Hopi mesas, where I was doing a science outreach day. I love this scenery. I chose an alternate pangram, I liked the thought of suspicious squirrels. Speaking of being drawn, since I was at the scanner anyway I scanned in my drawings from Myra's "7 things" experiment. I'm not good at the whole drawing thing. The one that looks like a beet with foliage is supposed to be a cherry blossom branch in a vase. And to complete Monday morning's random post, here's just about the only picture I could get of the cabbage-dyed Easter eggs I made this weekend. Max has decided that he LOVES boiled eggs, and he was going through our half dozen at quite a clip yesterday. Eggs were not standing still to be photographed. You can get an idea of the very pretty gentle blue color by the eggshells in the foreground. This was an accidental purse. Because it started as a cat head. Can you picture it? Upside down? I started crocheting the very popular posable kitty, using the first pattern I found in the book [*]. It turns out that pattern was for gigantic kitty. 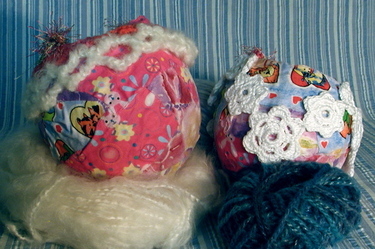 The head took most of my ball of yarn, as well as quite a few hours. I didn't really want a giant kitty, so when I realized where this pattern was going I changed it into this purse instead. 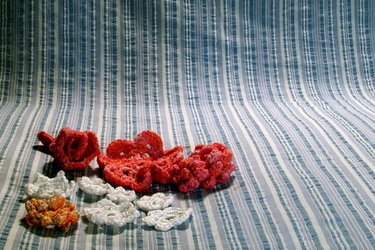 And then added the crocheted flowers. I added a cocoa-colored ribbon and put a string of pretty beads on each of the ends. I like how this one came out, it's light and springy. 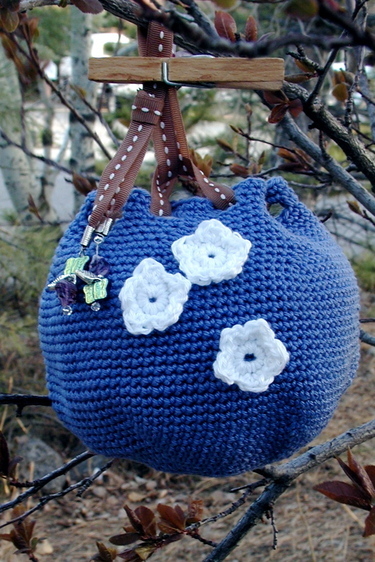 [*] It was quite some time ago that I made this purse, something like 8 months. It took me a long time to finally finish it. Because it takes a very long time to thread ribbon through eyelets. Really it does. With my new work schedule, I've been starting my day with a coffee at the local veggie-hippie-alternative coffee shop that opens at 6am, Macy's. Not to be confused with the store or the parade; our Macy's is definitely more widely known in these parts. Since yesterday was a Saturday, I took Max with me. 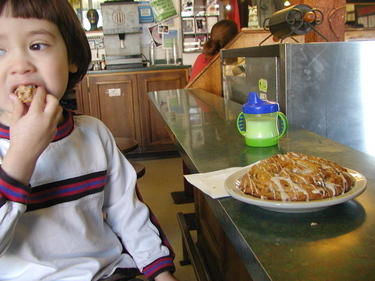 He likes their cinnamon rolls. 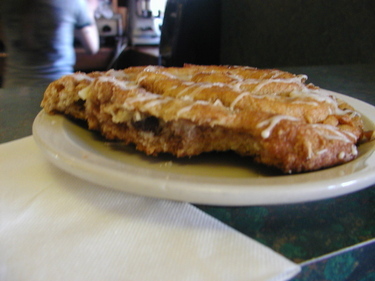 Today they included chocolate chips, so life was good. 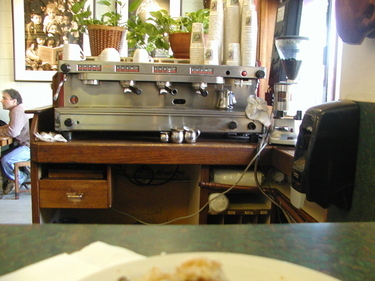 Max got to sit up on one of the tall stools by the front, and occasionally watch them make coffee for people. 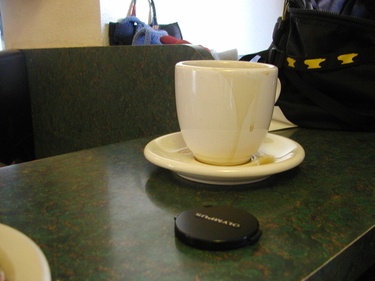 Plus we talked about lots of things and talked to a few people sitting near us. It was a good morning. Here are some pictures that Max took. Happy Easter and Passover, everyone! 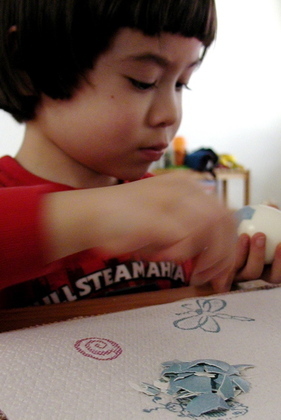 Last night I tried dyeing eggs using natural food dyes, after being inspired by Kelly's beautiful Easter eggs. Of course, it was 1:30am by the time half the eggs came out of the dye, so there are no pictures. The other half I left in overnight so they would get dark. I'm headed home now to see how they turned out! Recently I was contemplating life, the universe, everything. Wondering where my time for crafting has gone. Admittedly my new work schedule has wreaked havoc on whatever personal schedule I used to have, but that's not the whole answer. I thought about what I do during a day, and finally realized that this new "craft" has been taking up a lot of my time. 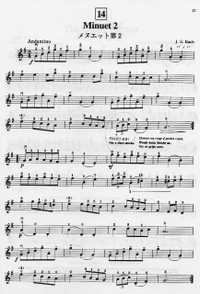 This is the violin piece I'm working on. I mentioned briefly a while back that Max was in Suzuki violin, starting last September. Well, while he likes his violin, it turns out he's not into taking classes. He's only 4, so I'm not concerned. The teacher said it was ok, she'd just teach me and Max could accompany me to classes. Since then, I've become hooked. I'm amazed that I can make such sounds with a violin. This is my first Bach piece. I've always loved Bach, he was my favorite composer back when I used to play piano. So I was very excited to get to this piece in my book. Much to my surprise, I've found that I'm practicing 1 or 2 hours a day (more before recitals, eek). And I'm finding it to be really relaxing. Such that when I'm stressed, I'll go grab the violin. It used to be knitting that I grabbed, but now it's the violin. It even works to help me stay awake when I have to work nights (like tonight). To tie this to the type of craft I usually do, I have a plan for a chinrest bag. The chinrest doesn't fit inside the case, so my teacher suggested I put it in a bag and tie it to the handle. Which I've done, but I've stolen one of Max's bags that my mom made for him. Actually, that bag was one she made for herself to carry her lunch in, and Max stole it from her. We're a big family of bag stealers. Anyway, I have a plan to make a quilted one, so I can give Max back his other bag. Perhaps I'll get to that soon. This little thing has been a lot time in coming. 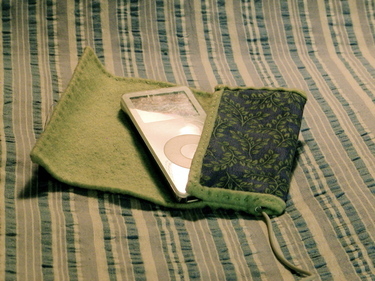 Finally, it's my iPod cover. You might be able to see from the second picture that it's too late, as my screen is already scratched. When I first got it, I was just tossing it in my bag. 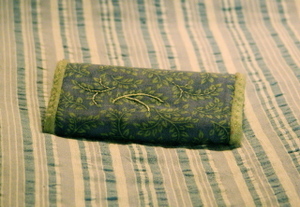 Then I noticed that the screen wasn't handling this well, so I would wrap it in a washcloth (not very pretty). All the while planning my cover. I spend way too long planning. This is still just a prototype, I had much grander plans, but you know what? It works pretty well as is. Lene over at Dances with Wool has a nice post on finding just the right project for a special collection of wool. I feel like that sometimes (sometimes? ha! who am I fooling?). Unable to find the perfect project, unable to start, I continue to search/wait. I like her solution, I'll have to try it the next time I'm stuck (which should be in about 2 minutes). The lovely viney fabric I got in a swap from Persephone. I had some lime green wool felt that matched perfectly. I tried some embroidery on the cover, partly for decoration and partly to keep the felt and cotton together. It accomplishes the latter, but mostly blends too well to be seen. This one is all hand-stitched, but in retrospect there wasn't much reason to do that. 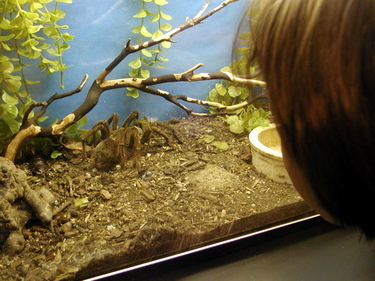 I had planned a peek-a-boo window so I could use the controls without having to take it out of the case. But it turns out to be not that much trouble to take it out of the case. The one thing I do wish I had done was to add some sort of holder to grab the earphones (now I'm just wrapping them around the case), but I can still do that. Hello everyone! I'm still here! I can't believe it's been almost a month since I last posted. Wow, I've missed my blog, and especially the interactions with all of you. Well, I finally managed a string of free time periods, so here are some pictures of what I've been up to. The crafting part, at least. I had a few of these baskets left over from Valentine's day. 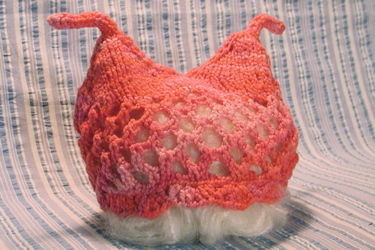 I had an idea of crocheting a kind of a collar for the top of the basket. The one on the left has crocheted scallops of pink cotton (Wool in the Woods Helix) and white fluff (Patons Divine in Icicle White). 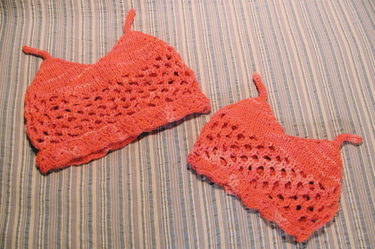 The one on the right has white cotton crocheted flowers. 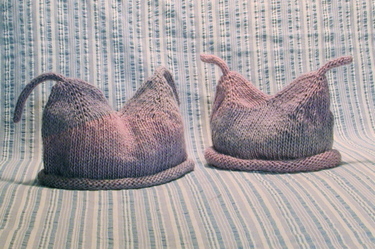 They both have knitted I-cord handles made from Fun Fur (Lion Brand) in a pastel color called Confetti. If you look closely, you can see that both baskets are filled with something. These are presents for two of my bloggy friends, so I'm not going to tell you what's inside just yet. I like these, but I'm not as happy with them as I envisioned. I think part of the reason is that the baskets themselves are so colorful, with the various combined fabrics, that adding a collar of any form might be a little too much. The reason I 'm not that happy with the flowers is that I think they're a little too large in scale. 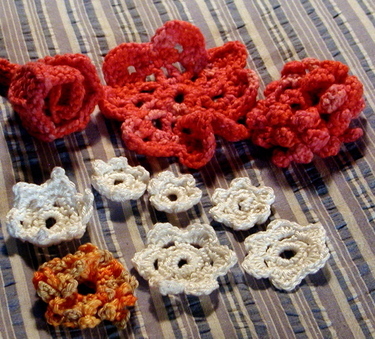 Just for fun I crocheted and knitted a bunch of spring flowers. Some of them ended up one of the baskets, the others make a nice collection. Top row, left to right: flower posy from Lucinda Guy's "Handknits for Kids," p. 28, posy from Reader's Digest "Complete Guide to Needlework," p. 367, chrysanthemum from RD, p. 367. Ch 6, join into a ring with sl st.
Sc 11 into loop, join with sl st.
(Sc 1, ch 2, sk 1) repeat around, join with sl st into first ch-2 space. Into each ch-2 space: (sl 1, hdc, hdc, sl1), join. Into each ch-2 space: (sc 1, hdc, dc, dc, hdc, sc 1), join. Into each ch-2 space: (sc 1, 3 ch, sc 1), join. Into each ch-3 space: (sc 1, hdc, dc, hdc, sc 1), join. Whew! I hope to keep posting, we'll see how well that works. And I still have so many blog posts to read. My bloglines number is so high! Of course, it's impossible to keep up because everyone is so productive and keeps posting, so there are too many fun posts to enjoy! Isn't that a good problem to have?